This is part 2 of Db2 application tuning for Db2 Explains and db2advis. We are on a mission to make Explains and the Db2 Advisor faster and more efficient. PLEASE review PART 1 as a prerequisite so that the information flow is fresh in your mind before continuing. This blog picks up where Part 1 left off. Would you like Db2 LUW Explains and db2advis.exe to run faster and more efficiently? If so, then this blog is for you! Explain and Db2Advis are applications just like any other, and their performance can be improved by adding indexes to EXPLAIN and ADVISE tables! In this new series of Db2 LUW Performance blog posts, we will share with you our performance analysis of Db2 EXPLAIN and Db2Advis processing and SQL with the goal of ultimately providing you with CREATE INDEX commands that will make Explain and Db2Advis processing faster and more efficient. You might be thinking "Who cares?" Well, everyone should care because efficiency is important! And if your management is hounding you for a performance fix to a failing application, you probably want your Explains and Db2Advis to run as fast as possible! DBI Customers using DBI pureFeat™ Performance Management Suite for IBM Db2 LUW V6.3 or V7.0 will also find this analysis, and the recommended new indexes, very beneficial to DBI's Predictive Index Impact Analysis processing! Briefly, Impact Analysis discovers all of the SQL contributing I/O to a table, then Db2 Explains are run with and without contemplated indexes to ascertain the benefits and risks, if any, of creating a new index. IDUG Vendor Sponsored Discounts! Save 25% off your IDUG Registration! Would you miss your daughter's wedding? Your son's graduation? The birth of your child? IBM is giving birth to new emerging technologies. Your DB2 Cheese is moving. Will you be able to keep up? Or will you miss the biggest, most important, IBM technology centered event of the year? IDUG is a non-profit, user run, organization focused on delivering the best education to data professionals, and the IDUG Anaheim conference includes the Data Tech Summit which is focused on not only DB2, but also emerging IBM technologies. If you are a DBA, Manager, Director, Data Architect, or Data Scientist, you must not miss IDUG Anaheim 2017. IBM DB2 and SAP - A marriage made in heaven? Or Not? The following article on DB2 and SAP is contributed by Martin Hubel. IBM is providing DB2 SAP Road Show Briefings THIS WEEK in select cities. Scott Hayes offers his own commentary on DB2 and SAP. Martin Hubel is an IBM DB2 GOLD Consultant and IBM Champion. He is also one of the world's leading top independent DB2 Consultants with respect to DB2 performance. We hope you find his article thought provoking and helpful. 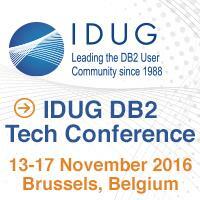 Great Reasons to attend IDUG EMEA in Brussels! The early bird might be dead, but you can still get a big worm! Use registration code "2016DBI25" and get 25% off your conference registration! This is made possible by a cooperative effort between top IDUG Exhibitors and IDUG inasmuch as vendors are seeking to help boost attendance at this incredible conference! This is just one great reason to attend IDUG EMEA - saving money! Continue reading for more great reasons to attend! IDUG NA 2015 DB2 LUW SESSION BINGO! C15 :: C16 :: D17 :: C18 :: D19 :: E20 :: D21 You win! Austin, TX USA (March 26, 2015): Dallas-based PrimeSource Building Products, one of the largest purveyors of fasteners in the world and one of the largest distributors of building materials in North America with 39 distribution centers and 1,200 employees across the United States, Canada, and the Caribbean. In March of 2014, as a growing, vibrant company with dynamic customer-driven leadership, PrimeSource Building Products was facing one of the most serious problems a thriving company can encounter: their SAP DB2 database had become painfully slow, affecting orders and inventory control. The result: a rising chorus of complaints. Will you be in the Phoenix AZ area during May 13-15? Are you a DB2 professional? DBI Software invites you to join us, free of charge, in the IDUG Exhibit Hall, booth #105, with this FREE PASS! Check out the latest DB2 solutions and enjoy magic performed by professional magician Frank Velasco at DBI's Booth #105! Austin, Texas USA - (March 27, 2014) - HealthPlan ServicesSM (HPS), the nation's leading technology, sales, retention and administrative services provider for the insurance and managed care markets, has selected DBI Software's pureFeat™ Performance Management Suite for IBM DB2 LUW as its strategic DB2 performance monitoring, tuning, and trend analysis tool. Austin, Texas USA - (December 11, 2013) - DBI Software, an industry leading IBM DB2 LUW performance tools provider, announces a new multi-faceted partnership with Hewlett-Packard Company (NYSE: HPQ). This partnership pairs DBI's revolutionary database monitoring, tuning, and trending tools with HP's outstanding customer relationships to bring a truly powerful DB2 database support solution to the market. Under this partnership, HP will offer DBI's tools as part of its managed services customer outsourcing agreements to accelerate value for HP clients and, for non-outsourced clients, HP will be a DBI authorized reseller. DBI pureFeat™ Performance Management Suite for IBM DB2 LUW was just honored by DBTA as a Top 100 Trending Product for 2014. No doubt, DBI offers great tools! However, marketing is not our specialty! Take a short 5 question survey and help us choose the best banner ad for web advertising! Please! Want to attend IDUG NA 2014 in Phoenix for Free? The IDUG North America 2014 Call for Presentations is OPEN through 4 October 2014! If your presentation is selected, IDUG will give you a free badge! If you speak about your experiences and successes with DBI's pureFeat™ Performance Management Suite for IBM DB2 LUW, DBI will support you with travel and living expenses! THAT'S FREE! Hurry! Not a DBI customer yet? We can fix that too! 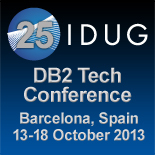 The IDUG DB2 Tech Conference in Barcelona is coming 13-18 OCT! Are your bags packed yet? Updates! Deciding what sessions to attend can be quite difficult, especially given the selection of awesome sessions this year at IDUG. Michael Krafick offered some good advice in his guest blog on DB2commerce.com. In this blog post, I'm going to sort out my schedule for the week. Hope to see you in the conference rooms! Going to #IDUG Orlando? Bookmark this page on your mobile device! Bookmark http://www.DBISoftware.com/idugna13.php to view #IDUG or #IDUGNA tweets for the latest news, information, and gossip on the IDUG DB2 Tech Conference in Orlando. Check it out! The two most powerful words in the English language: FREE FOOD! Actually, "free beer!" But, CLICK HERE for a FREE PASS to the IDUG Orlando Exhibit Hall, then come visit DBI Software in booths 103/105 to learn about DBI's PureFeat™ Performance Management Suite for DB2 LUW! DB2 LUW Performance: Good News! A new IBM Red Book is Born! In 2010 and 2011, the "DB2 LUW Performance Analysis and Tuning Workshop" drew top attendance numbers in North America, Australia, and EMEA. For 2012, this IDUG Ed Seminar has been updated and is being offered again as session 1084. Click Here for Details. THIS SEMINAR WILL NOT BE OFFERED AGAIN after 2012! This is your FINAL OPPORTUNITY to reap the rich benefits of this class! In this full day class, you will receive over three dozen SQL Snapshot commands to help analyze YOUR database. Together, we will learn about what to measure, we will discover the problems and "opportunities for improvement" in your database, we will discuss solutions, and you will return to your office fully equipped to make measurable performance improvements. Austin, Texas USA - (May 23, 2012) - DBI, a software company providing professional grade database performance management tools, today announced special pricing incentives for IBM DB2 LUW customers that acquired performance tool licenses from IBM or other vendors. Similarly, Oracle customers that acquired OEM performance tools, or tools from other vendors, will receive credits. Find all of the #IDUG #DB2 Tech Conference Twitter Buzz in one Place! Watch or Join the #IDUG (or #IDUGNA) DB2 Tech Conference Twitter Conversation: Visit and bookmark http://bit.ly/idugna12 to monitor IDUG Twitter Conversations. Feel like contributing to the discussion? Use hash tag #IDUGNA or #IDUG. DBI is a GOLD Sponsor of the IDUG DB2 Tech Conference in Denver and is pleased to provide this additional free service to the DB2 community. This is part 2 of "Best Bets" for The IDUG DB2 Tech Conference in Denver. Suggested sessions for DB2 LUW on Thursday and Friday are highlighted in this blog post. Monday, Tuesday, and Wednesday are discussed in PART 1.